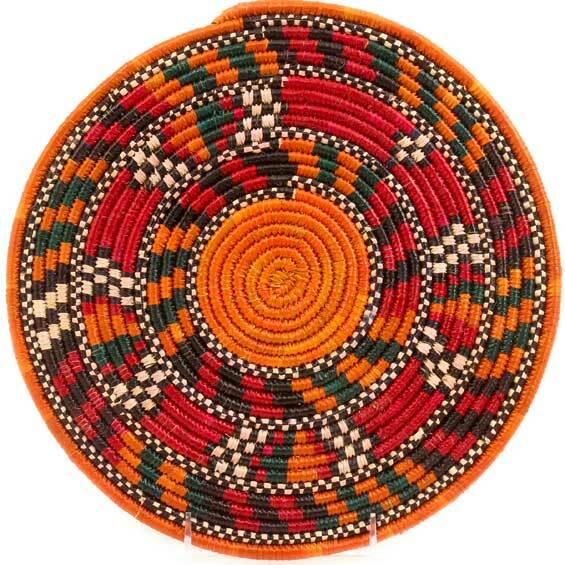 This beautiful Nubian roundel is flat, making a good trivet or wall decoration. It features traditional colors and patterns. Woven by Nubian women of Darfur, Sudan, these baskets of peace, hope, and strength represent the people's inspiring courage and resolve. Over the years, the people of Darfur have been displaced by conflict, war, building of the Aswan Dam and other factors. They have resettled in Kenya, Uganda, and other nearby countries. These coil-stitched baskets are created using the most difficult weaving techniques, tightly wrapping smooth palm leaves around coils of papyrus stalks. 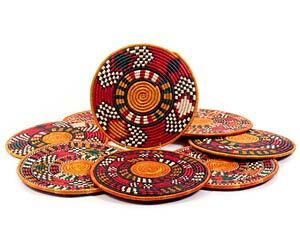 Nubian baskets feature distinctive bright colors and intricate patterns. The palm leaves give a sheen to the surface of the baskets.